Studio t is the first to bring the casting profession to Italy. Thanks to our extensive experience and know-how from working with a myriad of local & International productions, we are able to resolve the many difficulties which may arise in composing a successful cast and offer a seamless efficient service that will satisfy your every casting need. Studio t was founded in 1985 by Lilia and Roberto Trapani. We are located in a loft, in a typical Roman neighbourhood between Castel St Angelo and St Peters. Our know how is based on years of experience in the field, from which we have learned how to resolve the many difficulties which may arise in composing a cast. We are the first company to begin casting in Italy . Many famous actors had their first auditions through us, and it is a great satisfaction to see their careers develop and succeed. As we are active in every field of show business, we come into contact with a vast array of performers. Through our love for stage work we are in contact with numerous well and lesser known actors, all of whom are quality performers though not all are active in the TV. Fiction circuit. Our experience in casting for international productions has given us specific knowledge of the English speaking community of actors in Italy. Our contacts in casting on an international level, enables us to support our clients throughout Europe. Currently we speak English, French, German, Italian & Spanish. Infact, we often work with international productions. In order to assist directors and producers identify the right performer for the right role, it is essential that lighting, sound and every technicality are well studied and tuned to bring out the best in the actor. Actors should feel at ease and relaxed, knowing that we are there to help them give their best throughout the audition. Following direction during an audition, using appropriate make up, costume, or if necessary helping create of a set, all contribute to a smooth audition . An audition well done helps the director, production team and performers enormously. A huge variety of artists, from stunt men and street artists to more mainstream performers are included in our database. As our archive spans artists in such a diversity of fields, we are able to identify and match specific characteristics required. This helps us to be comprehensive and diversify our proposals to directors. In this way, we not only propose actors for central roles, but also for more minor ones, which, if well chosen, can add much flavour to both cast and production. Our digital archive with supporting show reels is constantly being updated. We provide our casting clients with screenings if there is no time to organize an audition ad hoc, or if an actor is temporarily unavailable. If you urgently need to see auditions, we can render the auditions soon after recording and place them on our website with password access. Our expertise and experience in the sector allows us to solve many different problems that arise in the composition of a successful cast. since 1985 Studio-T is the point of reference for anyone who needs to organize a casting in Rome. We are located in a charming loft in the heart of ancient Rome, located between St. Peter's and Castel Sant'Angelo. We have learned how to resolve the many difficulties which may arise in composing a successful cast. From big international productions, television series or advertising, we've got you covered. Proactively envisioned multimedia based expertise and cross-media growth strategies. Seamlessly visualize quality intellectual capital without superior collaboration and idea-sharing. Holistically pontificate installed base portals after maintainable products are produced and shared leading to fantastic results. developed for Musical directed by Max Giwa, Dania Pasquini, produced by Vertigo Films. Coming soon, Mary Magdalene by Garth Davis with Rooney Mara and Joaquin Phoenix. Italian casting by Lilia Trapani of studio-t.
End Shooting for MEDICI; MASTERS of FLORENCE, 2nd season. December 2017: End Shooting for MEDICI; MASTERS of FLORENCE, 2nd. season. Currently casting for director Garth Davis (Lion) for the film “Mary Magdalene”. 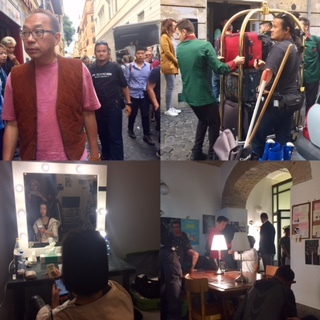 Shooting in Italy to start soon. THE HABIT OF BEAUTY in competition at Montreal Film Festival! THE HABIT OF BEAUTY is in official competition at Montreal Film Festival for our International Premiere. Casting by Lilia Trapani. ‘CAFFE’ by Cristiano Bortone to screen at 73rd Venice Film Fest!